China plans to use the J-31 stealth fighter for its air force and navy, according to a recent report from Aviation Week. 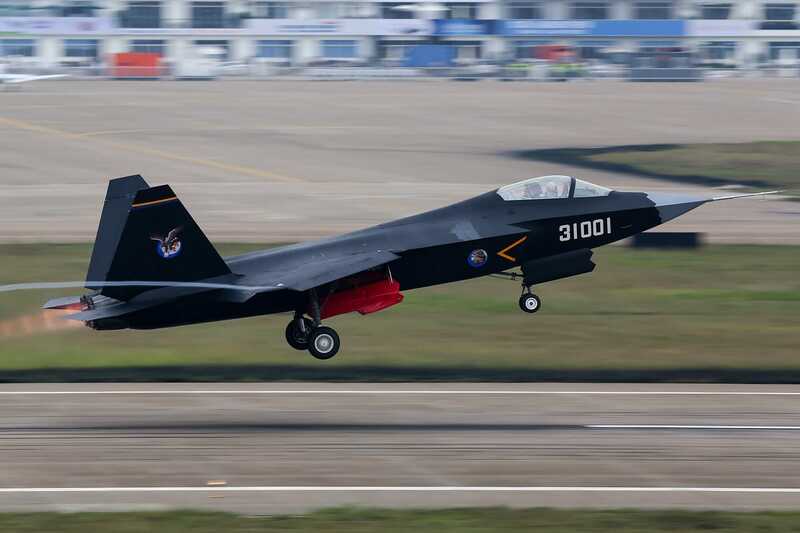 The J-31, which is China’s second stealth fighter after the J-20, is “being developed for domestic military service under government contract,” Aviation Week reported, citing an official source. China’s People’s Liberation Army Navy will likely replace its troubled J-15 carrier-based fighter with the J-31, but it’s unclear how the People’s Liberation Army Air Force will use it, Aviation Week reported. 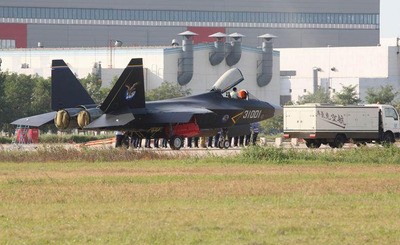 After China’s J-31 stealth fighter made its first full-scale public appearance in 2014, observers noted its striking resemblance to the F-35 Joint Strike Fighter. And many weren’t surprised: China was thought to have stolen unclassified F-35 design information five years earlier. Here’s how the J-31 stacks up against the F-35. The J-31 had already resembled the F-35 — both are multirole strike fighters — when a scaled model of it was unveiled in 2012. Although the J-31’s full specifications are not yet known, the J-31 and F-35 have roughly the same weight, height and wingspan. 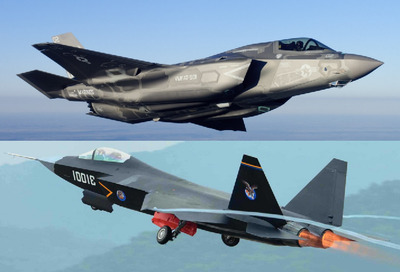 Public DomainA side-by-side comparison of the F-35 (top), and the J-31 (bottom). But the J-31 has a maximum takeoff weight of 56,000 pounds and a maximum range of 775 miles, making it lighter than the 70,000-pound F-35, and with roughly half the range. wc/Wikimedia CommonsThe J-31 takes off during the 10th China International Aviation and Aerospace Exhibition in November 2014. The J-31 has the reported edge in speed, as it can max out at Mach 1.8 while the F-35’s can only reach Mach 1.6. The J-31 is a twin-engine aircraft, and the F-35 is a single engine aircraft. In fact, the slightly improved J-31 prototype (there are only two known to exist), which first flew in December 2016, was equipped with a cleaner burning WS-13 engine, among other improvements. Beijing has even claimed that the J-31 will eventually have supercruise-capable WS-19 engines, giving it a leg up on the F-35. The J-31 might also one day be able to carry 12 air-to-air missiles, double the F-35’s armament. But unlike the J-31, the F-35 has a sensor suite giving the pilot greater awareness of the battlefield and is basically a flying data hub that shares target tracking information. Tonkatsu298/YouTubeThe J-31 deploys drogue parachutes to rapidly slow upon landing at the 10th China International Aviation and Aerospace Exhibition in 2014. China’s People’s Liberation Army Navy will likely replace its troubled J-15 carrier-based fighter with the J-31, but it’s unclear how the People’s Liberation Army Air Force will use it, Aviation Week reported in November. The AviationistOne of the first known pictures of the J-31 right before or after making its maiden flight in 2012. 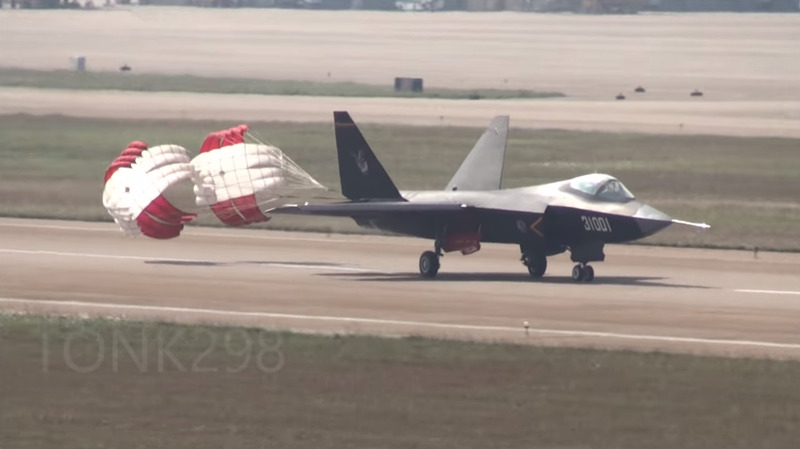 You can watch the J-31 in action below.